Okay so the picture isn't the exact thing I love but it sort of ties in. I love spaghetti! Like 150 percent. And tonight, for love day we made some. Like homemade meatballs, and everything. It was my mamas recipe (1lb ground beef, 1lb sausage, 2 beaten eggs, 1/2 onion chopped fine, and 1/2 cup bread crumbs) Yum! Its my favorite food. And we even enjoyed this special meal with sugar free juice in our wine glasses. happy v-day! So the picture. 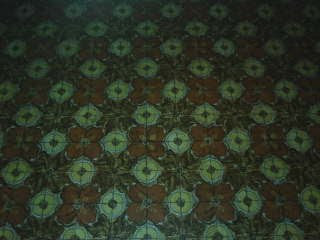 Its linoleum from my childhood home in Utah. The same exact kind! It also happens to be part of the flooring in the new pizza place right here in Chino Valley! Its a small small world. It seriously took me back to days of spilt Kool-aid and homework at the kitchen counter. That kitchen is also where I got the scar on my eyebrow that you can still see. Anyway, I love spaghetti and I love linoleum.